Awhile back I found this photo tucked away in one of my patterns. I taped the picture to a cabinet door where I can see it frequently. I find it so compelling as it makes me realize that we are who we are from the very beginning. Here we have the three girls. 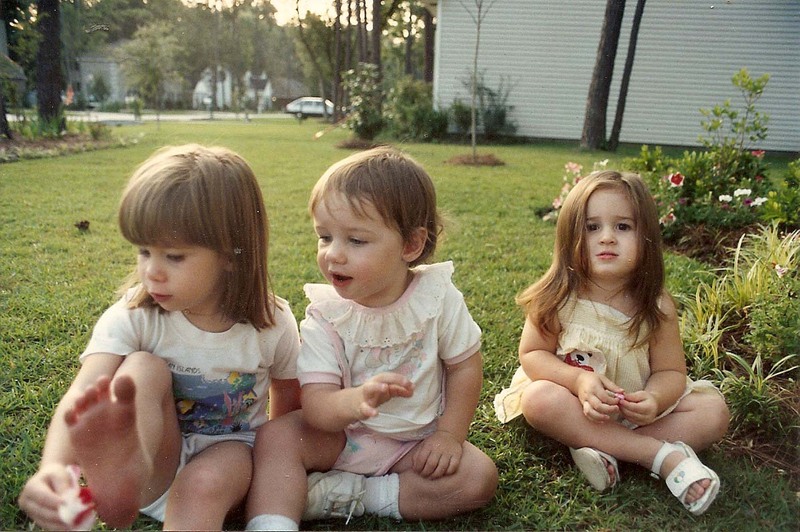 Two are playing, one barefoot, the other watching on in wonder, while the third girl sits a bit behind. Her look says it all .... I really don't belong here (with them). From the size and the coloring of the original picture, I'd say it was taken in the late 80s. So, these girls should be in their 30s now. I would be my projection that the two girls playing may be hands-on people, ready to experiment and take on the world. Whereas, the 3rd girl, may have grown to become high maintenance and waiting for someone to rescue her. I love finding things in these envelope ! I also love this photo. My take on the little girl sitting back is she is very smart and observant. I think the girl to the side is right, she doesn't belong with them. Maybe a cousin or a friends child? She is dressed differently, not so summer casual more like summer girl cute. Her hair and shoes are maintained differently. Likely she felt odd man out with the sisters and conscious that she had to keep her clothes nice. That's what I get from this delightful picture.